Remembrance services will be held across the isle on Saturday, November 11 and Sunday, November 12 for people to commemorate the contribution of British and Commonwealth military and civilian servicemen and women in the two World Wars and later conflicts. Saturday is Armistice Day, the anniversary of the end of hostilities in the First World War at 11 a.m. in 1918, with Remembrance Sunday always the second Sunday in November. The Parade will start in Elms Avenue at 10.40am and marches via Queen Street, King Street & Broad Street. 2pm Remembrance Sunday for all animals killed in all wars, Albion Gardens at the Destiny memorial. All welcome. Large fabric purple poppies on sale, £4 each at both events, proceeds to Guardian Angels Dog Rescue. Town war memorial, Trinity Square, 10.48am. Service conducted by Rev Brian Sharpe. The civic mayor’s procession along Northdown Road to the memorial with Cllr Rosamund Dixon will include dignitaries and The Mayor’s cadet, Cpl David Chapman, will act as her wreath bearer. 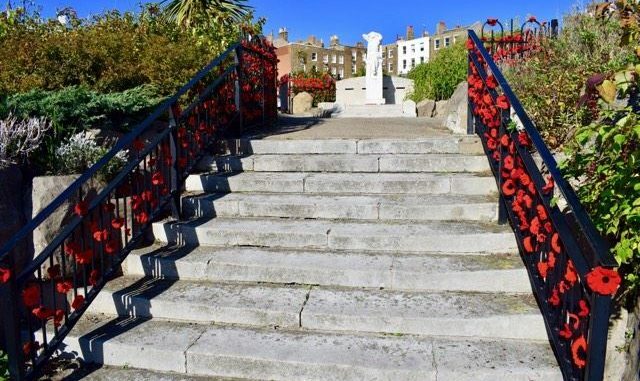 The Mayor would like to extend a welcome to the people of Margate to join her in this act of Remembrance. Civic ceremony held at the War Memorial on the corner of the High Street and Pierremont Avenue at 10:45am with local dignitaries, military representatives and organisations laying wreaths after the Remembrance Service. All residents and visitors to the town are very welcome to attend and join in with the service. Gather outside the church in Westgate Bay Avenue from 11.30am, ready to leave at 11.45am. The Act of Remembrance at the War Memorial in Sea Road begins at noon and will be led by the Revd Dr George Kalu, Minister of Christ Church Westgate-on-Sea and The Bay Birchington. The Revd Dr Peter Rowe (Priest-in-Charge of St Saviour’s) and Canon David Caine (Priest of the Parish of the Holy Family Birchington and Westgate-on-Sea) will also be taking part.